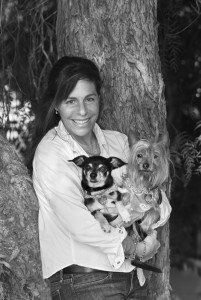 Wendy Nan Rees has been involved in the pet industry for over 25 years. Her career began when she founded Lip Smackers@, Inc., a company dedicated to providing healthy all-natural treats to consumers concerned about their pets’ well-being. The Lip Smackers bakery operated out of The PetCare Company, Hermosa Beach and CA. for over five years. Wendy has come full circle with her new book “The Dog Devotional: 365 Tips, Tricks and Techniques for Living a Rich Life with Your Dog”. It is a collection of many of Wendy’s most popular tricks and techniques used over her 25+ years as a Pet Lifestyle Advisor™, and is one of the most comprehensive “How to” dog books that has come along in many years. The real secret Wendy is teaching us is how to give back all the unconditional love that our dogs offer. While reading, you will be able to pick up on her tremendous enthusiasm! Other books published by Ms. Rees: The Natural Pet Food Cookbook: Healthful Recipes for Dogs and Cats published in 2007 is one of the few books sold by Whole Foods Markets. Wendy has included a collection of fifty natural-ingredient recipes, as well as information about holistic pet care. No Barking at the Table: Canine Recipes Most Begged for was self published in 1991, and sold over 5,000 copies with the first issue! This was so well-received that No Barking at the Table 2 and No Catnapping in the Kitchen were not far behind. Moving in a different direction, Wendy then published The Name Game, a collection of more than 100 celebrity essays along with over 1,000 suggestions of pet names. This fun book offers pet owners an entertaining and unique take on how and why people name their pets. A percentage of the proceeds from The Name Game go directly to PAWS, a nonprofit organization dedicated to helping people with HIV/AIDS to care for their pets. Wendy’s success as an author and dog-treat creator is no less amazing due to the fact that she was born with severe dyslexia and ADHD. The possibility of not graduating high school was a challenge that she and her family overcame. Whenever Wendy is presented with seemingly insurmountable obstacles, she charges ahead to prove all naysayers wrong. Wendy’s previous successes have led to numerous television appearances, and newspaper/magazine articles. She was the “Pet Lifestyle Advisor™” on Animal Planet’s Petsburgh, USA and was featured on The Home Shopping Network. Wendy also wrote a monthly column called “In the Kitchen with Wendy” for Your Pet Magazine. Not to rest on success, Wendy focused on her entrepreneurial side. She helped create Cedar Green ®, a line of all-natural odor eliminators developed with pet owners in mind. The signature product – AromaVac™ – is a heat-activated, natural odor eliminator that can be used in vacuum cleaners, dog beds, home air vents and cars. In 2000, Wendy was diagnosed with breast cancer forcing a break from her career. She bravely and successfully focused all her energies on recovery. Presently, Wendy is thrilled to say she is cancer-free and working on her worldwide internet radio show called, Wendy’s Animal Talk. You can hear her every Tuesday at 1PM PST at www.healthylife.net. She also writes two weekly pet-tip articles for the web site www.lovetoknow.com. Many words are used to describe Wendy Nan Rees…Best Selling Author, cancer survivor, inventor, Spokesperson and entrepreneur. While each of these terms is accurate, they are only part of a truly inspiring and creative woman, who uses her talents to innovate an industry that she has loved since a child—the world of pets. Wendy lives in Los Angeles with her Dogs Cappy and Little Man and her newest edition Sammy The Services Dog. “The animals in your life are not just your pets, they’re your friends. A Dog’s Voyage Around The World -Copyright 2008. Wendy Nan Rees. All rights reserved.